STAGE Participant Soars with Signals! STAGE participant Mrs. Teena Drake did not waste any time incorporating Signals of Spring into her science curriculum after taking the course in November 2007. 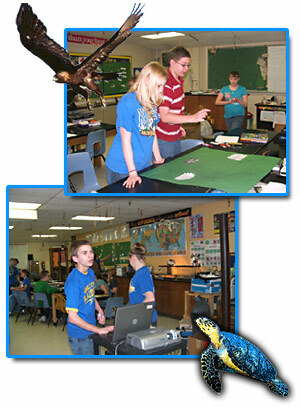 "I loved working with the STAGE program," exclaimed the science teacher at Trimble County Middle School in Kentucky. "The course was informative and offered just enough in the four hours." Mrs. Drake is pleased with how well the Signals of Spring curriculum fits Kentucky standards and finds it appropriate and exciting for her 7th and 8th grade students. The lessons require students to do scientific investigation and to think outside the box. "I encourage them to think about what they need to learn in order to understand why their species is tracking the way it is," explains Mrs. Drake. "Even when students have a species that is not transmitting, they learn from it. They ask why it stopped transmitting and I ask them to predict what may have happened. Students are not used to thinking like this," states Mrs. Drake, "They love it." Mrs. Drake's students share many positive responses to Signals of Spring. "I feel like a real scientist," exclaimed one. Another student stated, "Now I understand why science changes so much," and another said, "Thank you Mrs. Drake for allowing me to research a marine species. I want to be a marine biologist someday and this was great!" When Mrs. Drake began Signals of Spring in January she was pleased with the effectiveness of the lessons. At first glance, she was not enthusiastic about the chemistry in the photosynthesis lesson however, after completing the lesson with her students she found that they really understood the concept. "They were able to see that what is left over from one equation is used in the other equation," explains Mrs. Drake. "The puzzle activity worked very well." The walls of Mrs. Drake's classroom are currently covered with wall maps. Student teams write paragraphs explaining what they have learned and they post them on their wall maps so that classmates can learn from one another. Mrs. Drake's students are tracking land and marine species including Golden Eagle, Red-tailed hawk, Hawksbill Turtle, and Adelie Penguin. Students were particular excited to see the Red-tailed Hawk begin to move on March 26th. With Spring upon us they will be watching closely to see where the Red-tailed Hawk and other species travel.